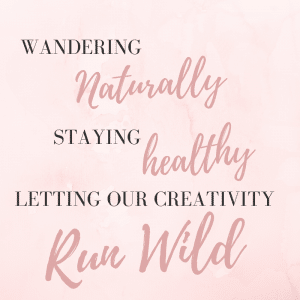 Going Clean – Why make the switch to natural makeup? Have you considered making the swap to natural makeup and a more natural beauty routine? If so, you’ve probably also been confused by all the contradictory information. It’s like trying to understand a new fad diet. Or getting a minor in chemistry. While there are some very clear reasons to change the products you use, it’s not an easy process. I think we’ve become very aware of what we put “in” our bodies, but not as much what we put “on” our bodies. I sometimes forget that almost everything that goes onto my skin is being absorbed. 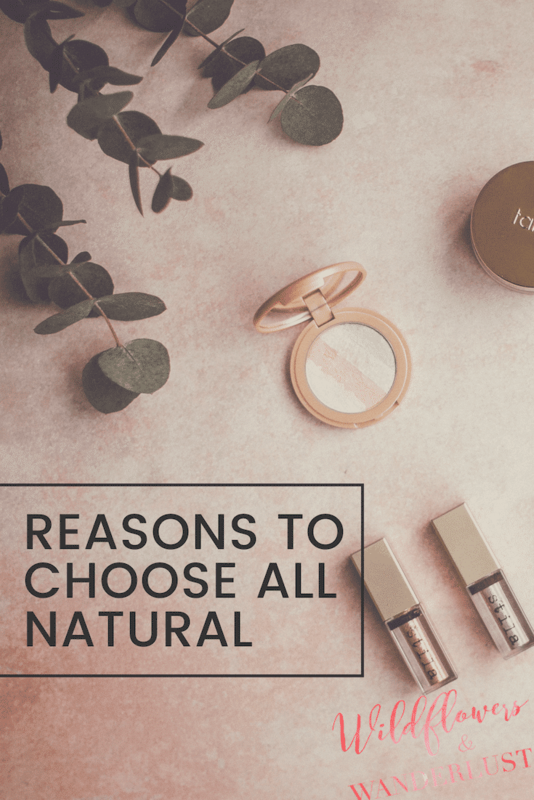 Here are my top 3 reasons for making the switch to natural products and I would love to hear yours in the comments below! I have used a harsh facial cleanser since high school. This cleanser rates a 5/10 on the Environmental Working Groups review. 10 is the highest rating and reserved for a product you really shouldn’t consider using at all. This cleanser includes BHT in the ingredient list ,which has been linked with cancer. In light of this information, I made the switch to a natural oil-based cleanser. Over the first few days, my face looked brighter and was more moisturized. I could tell a difference almost immediately in my skin. If you’re worried about switching to oil, don’t be! It’s great for many skin types and I’ve experienced brighter and less oily skin than ever before. The superfood craze has also extended into the natural beauty market so nourishing from the outside is easier than ever. Clean makeup can provide nutrients to repair skin while also offering coverage and color. It’s a frightening fact that women in the U.S. apply an average of 168 various chemicals to their bodies every day! Many of these chemicals are easily absorbed through the skin. Thinking of all of those potential toxins is scary. Clean makeups are also more beneficial to your skin. Ironically, some of the chemicals that we use on our skin actually make it age prematurely. Natural products and clean makeup will help nourish your skin without damaging it. The European Union has a list of 1,400 ingredients that aren’t allowed to be included in cosmetics. The U.S. list includes only 30. Multiple studies (like those summarized here) show that phthalates appear in samples of more than 75% of Americans. What’s a phthalate you ask? It’s an ingredient used in plastics to increase flexibility, transparency, and longevity in a product. 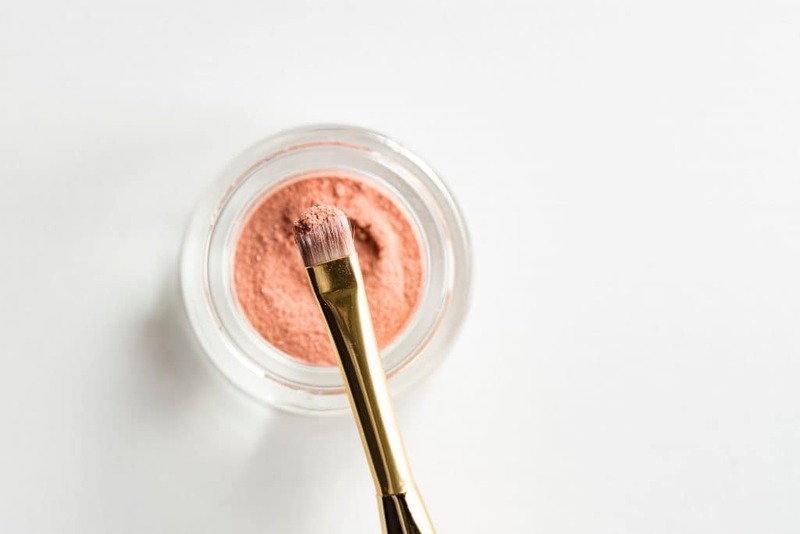 Phthalates are often added to cosmetics even though they have been linked to birth defects, infertility and liver and kidney damage. Parabens, petroleum and heavy metals are additional harmful chemicals that are found in many cosmetics. There are many more. Phthalates are often found in the perfumed items in your cabinet, and are also found in nail polish and hairspray. Luckily for us, 80’s hair isn’t in style, but these studies have made me second guess a trip or 2 to the nail salon. I want to have healthy babies someday! While traveling, I have noticed a huge variance across cultures about understanding and taking care of our planet. I spent a week with divers working to create protected reefs in Indonesia. In China, where I lived for a year, animal testing is a requirement for cosmetics. I have always enjoyed the outdoors and traveling has given me a greater appreciation of our diverse earth. We have so many natural resources to make use of. We definitely don’t need labs creating what nature makes aplenty. Be sure to choose USDA Organic whenever possible. This designation means 95% of the ingredients are organic. Organic products help protect our planet (and our bodies) from harmful chemicals. Another great thing to check for is the bunny on the label, which is a cruelty-free company certified through Leaping Bunny. Keep in mind that a product can be labeled natural without any ‘natural’ ingredients in it. Natural is not a word that is defined or regulated through the FDA. The same can also be said for a product labeled vegan. Be sure to check the ingredient list because vegan can refer to synthetic chemicals. It’s also great to note that green and clean companies, as a rule, are cruelty free. This means that they don’t support animal testing. So where to start? I recommend starting with the products you use daily based on how much and how often you use them. 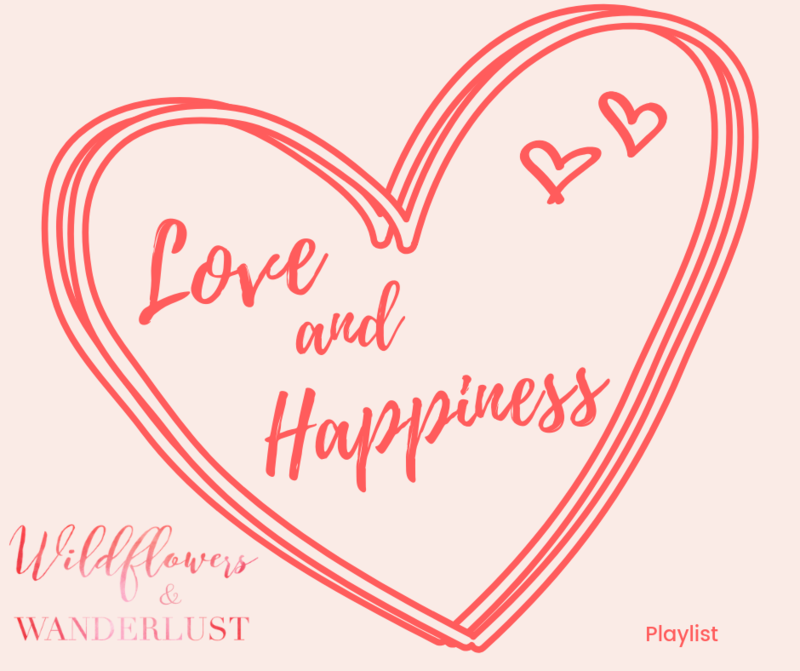 The main red flag ingredients to consider are sodium lauryl sulfate, paraben, phthalates, talc, musks, MIT, toluene, mineral oil, paraffin and petrolatum which may damage our bodily systems. Okay, so that’s a lot of ingredients to check for. There’s an app called Think Dirty that’s really helpful at determining how good or bad a product is. You can easily scan a barcode and it will tell you the ranking based on the ingredients. You can start by removing the worst offenders and replacing them with better products. 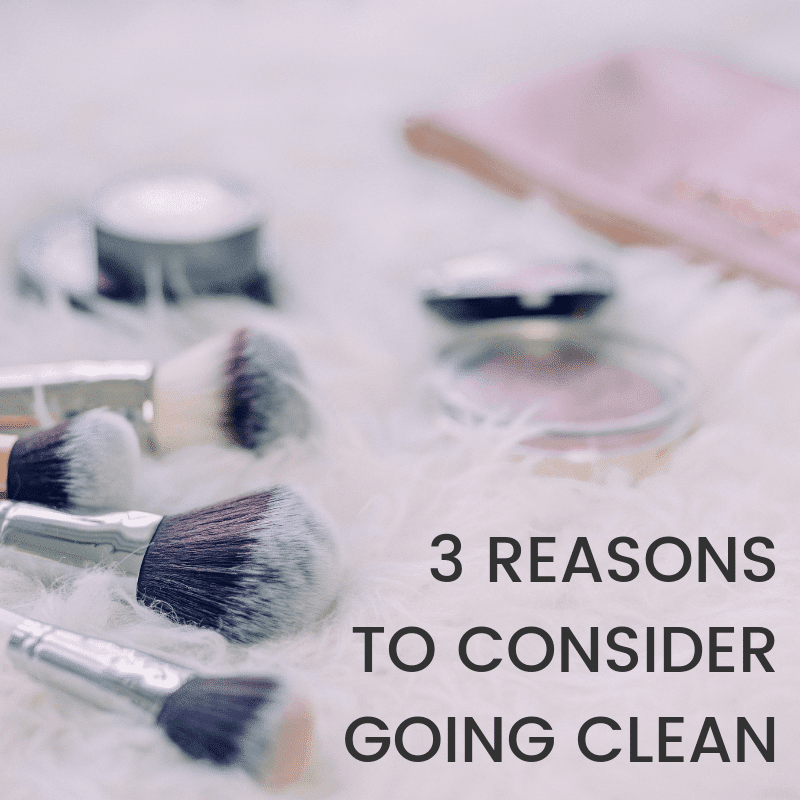 Another great thing about considering clean makeup are all the fantastic brands you can support who share a purpose to support healthier choices. Are any of these reasons you would considering making a swap to a more natural routine?